More than 200 people met in the Griffin School Cafeteria January 31st to get an update on the Conference Center application and to elect a new Board for the Griffin Neighborhood Association. Reporters and a photographer from The Olympian were on hand and an article describing the meeting appeared in the next day’s paper. The Conference Center is planned by a developer from California, the Willis Family Trust. An attorney hired by the Association, Tom Bjorgen, delivered a brief description of the steps we have taken to oppose construction of the Center. He then took questions from the audience. At the end of more than an hour on the Conference Center, Jerry Handfield, outgoing Chair of the GNA, literally passed a hat to those assembled. By the end of the night, nearly $3000 had been collected to help offset our current legal expenses. Voting members of the Association in attendance returned 14 of last year’s Board members. Kathy O’Connor, who has worked tirelessly on the County’s Cluster Development Task Force and has represented Association interests elsewhere with the County, has moved just outside the boundaries of the Griffin School District. Bob Whitener, an executive with the Squaxin Island Tribe’s Island Enterprises, was voted to replace O’Connor. Tom Bjorgen described efforts by the Association to convince the County to declare the application has lapsed. While the Willis Family Trust has not yet filed the Environmental Impact Study (EIS) required by the County, a Hearing Examiner in December decided the application would not lapse. If the application were to lapse, Robert Patrick of the planning firm Patrick Harron & Associates in Lacey, hired by the Willis Family Trust, has been quoted as agreeing that current county zoning would not allow the conference center to be built. The Association has appealed the decision by the Hearing Examiner. The County Commissioners will announce their decision on whether to declare the application to be lapsed in public session on February 20 at 4 PM, at the Thurston County Courthouse, 2000 Lakeridge Road, Building 1, Olympia. All members of the public are encouraged to attend this meeting. While the public will not be permitted to speak, either to oppose or support the project, it is important that we make our opposition to the project known to the Commissioners. GNA members will be on hand to distribute stickers which we can wear to express our position against this project. Unfortunately, the public cannot contact the County Commissioners on this matter, prior to the decision on February 20. The attorney for the GNA has filed the necessary legal arguments and individual Commissioners would have to recuse themselves from the decision, were they to have specific conversations with us about this appeal. If, on February 20, the Commissioners decide the application has not lapsed, it will be up to the Willis Family Trust to complete their application with an EIS. Once their application is complete, there will be a public hearing on whether the County should issue the Special Use Permit required for the application. This will be a public meeting and we will want all our neighbors to turn out to testify against granting the permit. We have no known date for any public hearings on the Special Use Permit. If the County Commissioners rule, on February 20, the application is not lapsed, the GNA may choose to take the matter to Superior Court. To do so, we will need the financial support of the community. Attend the Commissioner’s meeting on February 20 at 4PM. Bring 2 friends with you. Make a contribution to the GNA Legal Fund. Click here to make contributions online or by mail (checks payable to “GNA”) to 4931 Oyster Bay Rd., Olympia, WA 98502-9548. 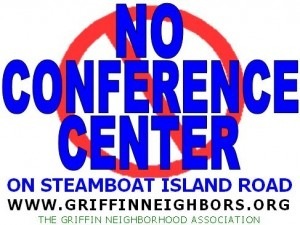 Display a “No Conference Center” sign on your car, home, and place of business. Click here for your copy. 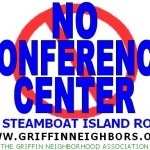 Tell your friends, “The conference center is not dead.” They can get more information online at www.GriffinNeighbors.org. Join the Griffin Neighborhood Association. As this application moves forward, we will continue to coordinate effective efforts to oppose it. Click here to join the GNA. UPDATED: An editorial, written by GNA Board member Steve Lundin, was published in the Olympian on February 11. Click here to read that editorial. Better yet, read the editorial and then attach your own comments, about the conference center, on the Olympian’s web site. Click here to read our prior Conference Center Update. Off-road vehicle noise can be a real problem, here in rural Thurston County. Two bills, one in the state Senate and the other in the state House, are well worth supporting. Griffin residents may express support by calling the Legislative Hotline at 1-800-562-6000. You may also email your support of these bills by visiting the web site of the Washington State Legislature. To address the need for peace and quiet in homes in residential neighborhoods, free from unnecessary engine noise from Off Road Vehicles (ORVs), this legislation sets reasonable limits on noise from recreational ORV operation in residential neighborhoods, sets fines, and allows costs and fees to be reimbursed to a party who has to sue to enforce the law. It reduces allowable tailpipe noise from 105 decibels to 96 decibels, consistent with the national standard and industry recommendations. It makes it a violation of the motor vehicle code (RCW 46.09) and the Noise Control Act (RCW 70.107) to cause noise from an ORV in a residential neighborhood that can be heard inside or immediately adjacent to a residence. This new state law provision is reasonable because it focuses on keeping noise out of homes. It supplements the current decibel noise limits for ORVs in state regulation and is easier and less costly to enforce. It also does not unnecessarily restrict ORV use as long as the ORV is operated so that noise cannot be heard in and around the home. This legislation does not change any of the current exemptions set in state regulation (173-60-050). It establishes reasonable lengths of time where ORV noise can exceed decibel standards set in current state regulation for express purposes, such as loading and unloading the ORV for transport. It establishes penalties for violations ranging from $100 for the first violation and increasing penalties for subsequent violations, up to a maximum of $800. It allows attorneys fees and costs to the prevailing party who brings an action to enforce the noise standards. This legislation does not prevent local governments from taking actions under local ordinances in addition to those authorized by this legislation. The increasing use of ORVs in residential neighborhoods, especially rural ones, is disrupting the peace and quiet of communities and negatively impacting the health of residents. This legislation allows simple, common sense tools to be available to neighbors so that peace and quiet can continue to be available in residential areas. These bills are SB 5544 and HB 1434. Click on the links, in the bill numbers, for more details regarding each. FutureWise asks, “How can you influence your Legislators about transportation issues that are important to you? The answer is: Come to Transportation Lobby Day 2007! Mark your calendars now for Transportation Lobby Day – February 6. Participants in lobby day will meet with Legislators, view presentations by special guests, network with fellow transportation advocates, and having a big impact on the transportation decisions that are made in 2007. Representative Judy Clibborn, the new Chair of the House Transportation Committee will be our guest of honor and give us her take on what’s happening in the Puget Sound region. This year FutureWise is teaming up with other partners in the environmental community – including All Aboard Washington, the Bicycle Alliance of Washington, the Cascade Bicycle Club, Feet First, Sierra Club, Transportation Choices Coalition and WashPIRG – to make a big splash in Olympia. For more information, visit the FutureWise web site. Last year the Thurston County Board of County Commissioners issued a development moratorium on all new subdivisions in unincorporated Thurston County, protecting our oyster beds, working farms, and drinking water supply. Now the Commissioners are being pressured to lift this moratorium. This Thursday, January 11th at 6pm, there is a public hearing on Renewing the Moratorium on Residential Subdivision at the Thurston County Courthouse (Building One) in Room 280, 2000 Lakeridge Drive SW, Olympia, WA 98502-1045. It is critical that we are there to speak in support of keeping this protection. Arriving early increases you chance of testifying. We believe the work that must be done before the moratorium can be lifted is not yet complete. Put Puget Sound and oyster beds are risk by allowing high density development in rural areas. Allow the subdivision of current unprotected working farms. Increase costs to taxpayers by allowing land development that will require urban services where they will expensive to provide. Put drinking water supplies at risk by allowing high density development in areas that contribute to drinking water for county property owners and residents. Harm the character of Thurston County by allowing urban style developments in rural areas. The moratorium will continue to prevent these adverse impacts on Thurston County. Retain choices for Thurston County as it updates its comprehensive plan. Preventing inappropriate vesting allows the county to update its plan without having to worry that the new plan will be undermined by poorly planned vested developments. Conserve resources. The moratorium will allow limited county staff to focus on the updating the plan rather than reviewing poorly planned developments. Please attend Thursday’s hearing and testify! It is again time to provide an update on the status of the proposed Steamboat Island Community Center at the corner of Steamboat Island and Sunrise Beach roads. More than 100 of our neighbors attended our public meeting on the proposal that we held in June of this year. Most opposed this project. The Griffin Neighborhood Association (GNA) needs additional money to continue our opposition to this project. We have hired a local land use attorney to assist in opposing this project. Please send your contributions, payable to “GNA” to: Griffin Neighborhood Association, 4931 Oyster Bay Road, NW, Olympia, WA, 98502. Use the memo field, on your check, to note the contribution is for the “GNA Legal Fund.” Contributions may also be made online at the GNA’s website. Click here to make a contribution, over a secure internet connection, using your credit card. The GNA feels that this project violates the county zoning code. It is proposed to be located in a single family residential zone, not a commercial zone. The applicant filed for a special use permit authorizing a “community club”. This project does not meet the definition of a community club, which is “a building in which members of a community or association may gather for social, educational or cultural activities.” A full-scale banquet kitchen is proposed. This is a 18,000 square foot conference/convention center that is more than twice the size of Saint Martin’s Worthington Center. A 4,900 square foot covered patio is also proposed, along with 150 on-site parking spaces. The proposed facility will have many adverse impacts on the surrounding area and Griffin community in general. It is not designed to serve local community needs. It is a large, urban intensity facility that will serve the whole south Puget Sound region. It is not compatible with the neighboring area and will create an ever spreading web of large scale commercial enterprises up Steamboat Island Road. It will dramatically increase traffic congestion along roads and through the busiest intersections in our area. Overflow parking will most likely be located along Steamboat Island Road and Sunrise Beach Road. This dense congestion could adversely impact the ability of the Griffin Fire District to respond to emergencies. Urban level public services will be required. Many residents have concerns with the facility’s impact on ground water and the sewage carrying capacity of the site. Many residents have concerns with storm water runoff impacts on Eld Inlet. Many residents object to adverse noise and night lighting impacts. It appears that the project has lapsed, as the applicant failed to start preparing an Environmental Impact Study (EIS) in a timely fashion. After many months of inaction and no communication with the County, the applicant began communicating with the County and finally submitted an EIS. The GNA filed an appeal with the County claiming that the project had lapsed, requiring the applicant to reapply and proceed under newer, stricter zoning controls. The County rejected this so the GNA appealed this decision to the Hearing Examiner. Briefs were filed and the Hearing Examiner will render a decision on this matter in a few weeks. If we prevail, it is likely that the applicant will appeal. If we lose, we may appeal. If the project application proceeds, we will oppose the project before the Hearing Examiner. A public hearing on the project will be held at that time. We will notify you of the public hearing. Potential appeals may follow any decision on the permit. 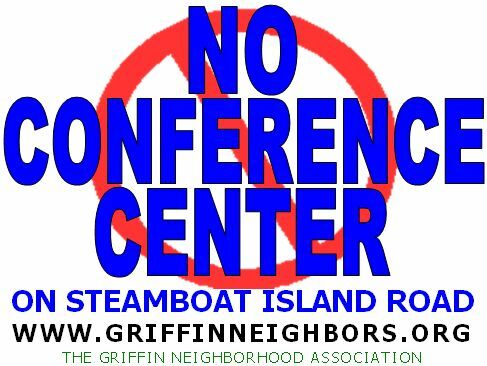 Again, we would appreciate contributions to continue our fight against the Steamboat Island Community Center. Click here for more information regarding this project. The Washington State Interagency Committee for Outdoor Recreation (IAC) has been asked by the State legislature to develop recommendations for the 2007 legislative session to improve the control of ORV noise in Washington State. The purpose of this study is to evaluate various approaches available for addressing ORV noise and to make recommendations to improve the control of ORV noise. The IAC is asking for your input on recommended options for addressing ORV noise. There are two basic techniques for controlling ORV sound: (1) limit it at source and/or (2) limit the amount of sound that reaches neighboring properties. The IAC is looking at actions that can be taken using both techniques, but they need your help. There is a potential for changing noise rules at both the state and the local jurisdiction levels, and an online survey provides questions which address both possibilities. Click here to complete the online IAC survey regarding options for addressing ORV noise. The survey must be completed by November 6th. If I-933 is So Good, How Come The Oregonian Is Recommending a “No” Vote? Throughout the debate regarding I-933, we’ve read and heard a great deal about Oregon’s Measure 37. I-933 is modeled on Measure 37, which was passed two years ago. Opponents of I-933 point to Measure 37 as a demonstration of the potential costs of I-933 while supporters of I-933 say that Oregon’s experience with Measure 37 proves that I-933 won’t be expensive and will achieve its intended effects. Now The Oregonian has chimed in with its editorial, entitled “I-933: Don’t follow this Oregon trail; Washington voters should reject“. If Measure 37 was so good for Oregon, why wouldn’t The Oregonian want it’s like to be exported to Washington state? “You can have it, Washington. All of it: The millions of dollars in legal fees, the billions in potential property compensation and the infinite cost of watching precious places, such as Oregon’s Steens Mountain, possibly opened to development. I don’t want any part of that. That’s why I’m voting “No” on I-933. UPDATE (10/25/2006): A new survey conducted by Greenberg Quinlan Rosner Research strongly suggests that Oregonians regret passing Measure 37. The phone survey was conducted in mid-October among 405 Oregonians who voted in 2004. The forum will be held at St John’s Episcopal Church at 114 20th Ave SE, Olympia (map) from 7 to 9 p.m. The forum will be moderated by State Senator Karen Fraser. Eric de Place, a senior research associate, with the Sightline Institute and blogger at the Daily Score. He has written extensively about the property rights and the impact Measure 37 (a proposition similar to I-933) has had on Oregon. David Troutt, chair of the Nisqually River Council, a decades long effort to bring together residents of the Nisqually watershed to assure protected natural resources and a strong economy. The council recently released a sustainability plan that will advance these goals. Sandra Romero, a former state representative, and active member of Livable Thurston will represent the No on I-933 campaign. The Old Dephi Schoolhouse is located at 7601 Delphi Road. Click here for a map. For more information, see the Delphi Association’s web site at www.delpiassoc.org. Most Steamboat Islanders know the Summer Fruit Truck. For the past two summers it’s been parked by the Grange where customers enjoy the best of Northwest and more exotic produce. The banana masthead had been hard to miss! The Fruit Truck is a transformation of the big tent opposite the Island Market where the community first came to know Madrona Grove Seasonal Open-Air Market, and its owners Michael Manos and Jeannine Anderson. For the past four years, Michael and Jeannine have been using their 1987 Buick Station Wagon, “Roselle,” to do all the hauling of fruit from Eastern Washington. Built to haul families on vacation, Roselle rose to the challenge and has performed an outstanding job, even after a roundtrip of 9000 miles, from Washington to Central America, the year before Madrona Grove was started. All those years, miles and pounds are finally taking their toll, and now Roselle is no longer able to make the long trip over and back across the Cascades. In addition, the weight and capacity of the station wagon proved inadequate even last year as the demand for great fruit steadily increases. This past year the Toyota, the Banana Truck, has had to pick up the slack and pull double duty as “The Fruit Truck” retail outlet, and to make the 20 or so trips over and back with fruit. It’s been a challenge for the truck, and Michael and Jeannine, but they’ve managed to pull it off with a lot of shuffling of stuff and many early mornings and late nights. In this fifth year of operation, it is clear that the business has become a part of the community that would be missed. A bigger, better vehicle is needed to carry on. Choosing a life of voluntary simplicity, as Michael and Jeannine have done, has meant opting out of eligibility to obtain financing for a new vehicle. We are proposing to the community and opportunity to “grub stake” a new fruit truck so that Madrona Grove can continue to bring local food to the community on a seasonal basis. The purpose of these community funded micro grants is to “seed” the financing of an economical, flexible vehicle which can transport fruit and produce in the summer, and, in the off season, do small hauling jobs to begin to support itself. A grub stake was money put up to finance prospectors in their mining operations. In a sense, agriculture is a form of mining. It extracts nutrients from the sun, soil and water and makes the foods that nourish and sustain us. By brining the fruits of many farms to our community, Madrona Grove participates in the mining operation. Madrona Grove is asking for micro-grants, or “grub-stakes” of $75 to help finance a 2006 Dodge Sprinter Cargo Van. Michael and Jeannine can manage the down payment. Oyster Bay Farm has offered to sign for the financing of the vehicle via a Guarantor’s Agreement on the financing contract (see The Fine Print). We have estimated that if we can get commitments for a $75 grub stake from 110 households, the payments for the first year of the truck’s operation will be covered. After that, we expect the truck to be self-supporting. Click here to download the brochure. To put up a grub stake, complete the small form, on the brochure, and mail it with your $75 check (payable to “Madrona Grove”). Access to the best produce of the summer season. Building a sustainable, local economy. Taking part in securing a local food supply. Over the past five years Michael and Jeannine have been developing relationships with small, family farmers living in Eastern Washington where land and climate come together to create a perfect growing environment for those luscious summer fruits we love. They also work directory with several small farms here in Western Washington for farm fresh veggies. Direct sales and sales to small retailers such as Madrona Grove allow these small farmers to keep more of the return on their farming investment than if they sent all of their food to the packing houses. Better for farmers, better for Madrona Grove and its customers. They also buy produce in season from neighbors here on the peninsula with gardens more bountiful than they can consume. “We will continue to do what we do for as long as we are able; to cooperate with small, family farms to bring their harvest to our community; and to maintain high quality standards at prices that make the food accessible and the business viable. The Dodge Sprinter is a top-of-the-line Mercedes Diesel vehicle with the Dodge name on it. It’s capable of hauling up to 3800 pounds, averaging 25-30 miles per gallon, depending on the load size. Pioneer Organic in Seattle bought several for their home delivery service, as did Essential Bakery and many other small food related businesses, including Western Meats in Tumwater. Pioneer Organics and Essential Bakery both run their vehicles on bio-diesel. The demand for this vehicle is very high and the manufacturer is preparing to expand their production facilities to meet that demand. There are limited quantities of them available this year, with availability pushed back to March 2007 after those are sold. The resale value of this vehicle is one of the highest in the industry. All grant funds (grub stakes) will be deposited into the Community Funded Micro-Grant account with Sterling Savings Bank. All grant funds over and above the cost of 1 year’s monthly payments will be applied directly to principal, until such time as the financing is complete. All grant funds over and above the complete cost of financing will remain in the Community Funded Micro-Grant account for future use by other community projects. A 10% down payment will be made by Michael Manos and Jeannine Anderson dba Madrona Grove, to Lynwood Dodge on a 2006 Sprinter 2500 SHC/140.Pat Labine and Kathleen O’Shaunessy, dba Oyster Bay Farm are guarantors for the financing. A monthly finance payment will be automatically withdrawn by the financing agency from the Community Funded Micro-Grant account. Copies of the guaranty contract between Madrona Grove and Oyster Bay Ram, as well as the finance contract are available by request.